These days, LEGO makes all sorts of LEGO heads. You can get LEGO heads with a winking eye. You can get a head with sunglasses. You can get a LEGO head with a headset and a beard. But do you remember what the original LEGO head used to look like? It was just a simple smiling face. Can you picture it in your mind? That happy little dude was the entire childhood of plenty of kids and even today, you can find that same head in LEGO sets that children play with now. In fact, your child probably has a few of them rolling around in their LEGO box right now! Now, with this LEGO mask for kids, your child can match his favorite toy. 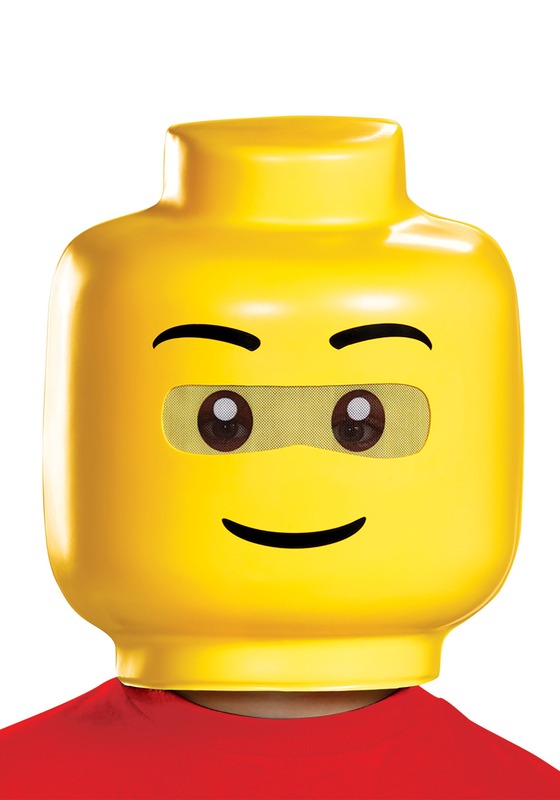 This LEGO kids mask faithfully recreates the look of the classic LEGO head. It has that rounded shape in front, along with the little nub on top that would normally hold a hat on a real mini-figure. It also has a printed happy face on the front, which will mimic the face your child will be making while wearing this mask. Any kid who’s spent hours constructing a LEGO masterpiece will love wearing this licensed mask! You can even pair it with a pirate costume to turn your kid into a classic LEGO pirate!